This Queen-Cola label dates to the 1910s and it is apparent from the similarity in logo design that this cola was intended to compete with Coca-Cola. 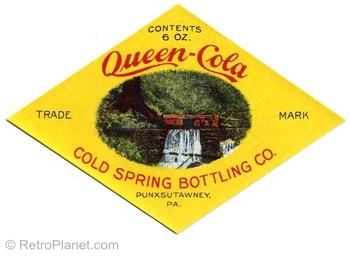 Queen-Cola was bottled at the Cold Spring Bottling Company in Punxsutawney, Pennsylvania—the home of the famous groundhog, Punxsutawney Phil. This label is about 4-inches wide and is well preserved. It has an illustration of what must be the “cold spring” at its center. It appears from the lack of later bottles or labels that Queen-Cola did not survive through the economic downturn in the U.S. caused by the stock market crash of 1929. If you know more about the history of Queen-Cola, be sure to blog-in and let us know so we can share your information with other soda pop fans.